A recent report in The Register suggests that we might be currently overestimating the degree to which the world will warm with increasing carbon dioxide. Climate sensitivity is, crudely, the slope of the relationship between CO2 levels and average world temperature. It is usually expressed as the number of degrees Celsius that will result from a doubling of CO2 concentration. If everything else were equal and the only effect was driven by the properties of CO2 then the sensitivity would be about 1°C. But many other factors also change in the real atmosphere, for example the concentration of water vapour, also a powerful greenhouse gas. So scientists have to find ways to estimate those other effects based on models or observations of the real, very complicated, atmosphere. The current consensus seems to centre around 3°C. Two interrelated questions arise: is this new estimate plausible? 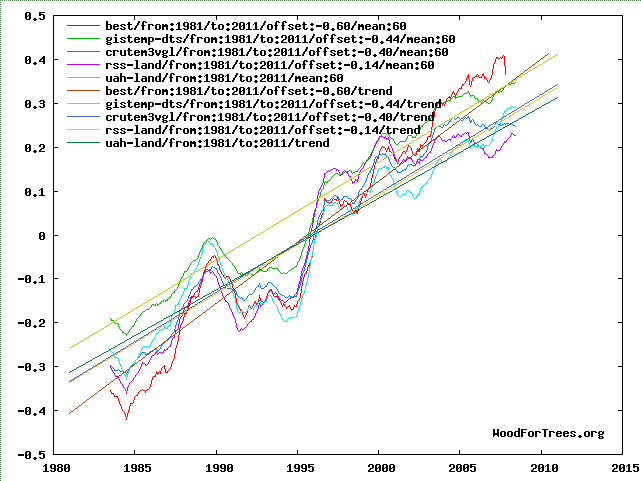 and is the lack of recent warming enough to force a reassessment of climate models? Could sensitivity it be lower than 3°C for a doubling of CO2e? Yes, it could, as the IPCC have said in their assessment reports, and as the science has said for decades. This single new study suggests a range of 1-2.9°C, which has huge overlap with the IPCC range. It is therefore consistent with IPCC estimates, and while it adds new data and new analysis to the existing large body of studies, it does not overturn them. When the researchers at CICERO and the Norwegian Computing Center applied their model and statistics to analyse temperature readings from the air and ocean for the period ending in 2000, they found that climate sensitivity to a doubling of atmospheric CO2 concentration will most likely be 3.7°C, which is somewhat higher than the IPCC prognosis. But the researchers were surprised when they entered temperatures and other data from the decade 2000-2010 into the model; climate sensitivity was greatly reduced to a “mere” 1.9°C. If 10 years of data causes that much of a change to the result obtained from 250 years of data, it's quite possible that their method is over-weighting the most recent data. It's giving too much weight to a small number of recent years. Because the number of years is small, weather noise will dominate climate trends. It's worth noting at this point that some of the Cicero work behind this press release was unpublished at the time of the press release, and none of it has yet been confirmed by other studies. Are we OK if forcing is, say, only 1°C rather than 3°C? No, because even in that incredibly optimistic scenario which is not supported by the vast majority of empirical data and studies, we're on course to raise CO2e from pre-industrial levels of ~280ppm to ~1000ppm, which would lead to a raising of temperature of 3-4°C, which puts us into very dangerous territory. Is it a safe bet to assume that sensitivity is much less? No, it's an insane gamble. And that's because the stakes are so high - this is an asymmetric bet. Let's take an extremely optimistic case, one that is so optimistic that it defies the known science, that there's only a 5% chance that forcing is 3°C, and a 95% chance that forcing is 1°C. The cost of decarbonising the economy is uncertain - it may be a net positive, or around 1% of GDP, and almost certainly below 5.5% of GDP. So, even in this extreme case where the vast bulk of climate science is wrong, the bet offered is at 95%:5%; the stake is human civilisation, and the potential value of a win is -1% to 5.5% of global GDP. That's not a sane one-off bet, it's an insane gamble. If we were going to average it out over tens of thousands of cases, then statistics would be on our side. But this is a one-shot gamble, the odds are for a high forcing, and the stakes are way way in favour of decarbonisation. Has there been a lack of warming over the last 14 years? No, not unless the laws of physics have changed. And we've got no reason to believe they have. We know the sun has continued to irradiate the Earth, at the levels it has for many years. And we know that the Earth's insulation, from greenhouse gases, has increased - we know that from huge amounts of empirical observation. So we know that the global heat content has continued to rise - that much is basic thermodynamics. A lot of heat gets stored in oceans; that means that it doesn't show up in surface temperatures, until we get one of those periodic releases of heat from oceans, which then boost global surface temperatures thereafter.